The Green Line is a biodiversity corridor project, which aims to protect and enhance the biodiversity and habitat connectivity of the former Koroit to Minhamite Railway Line in western Victoria. This linear reserve stretches 37 kilometres, encompassing four listed endangered Ecological Vegetation Classes, as well as numerous rare and endangered species. The project continues to enhance and protect the natural and cultural assets of The Green Line. By controlling weeds the Basalt to Bay Landcare Network has reduced the weed incursions into the native Grassland and Grassy Woodland areas. The re-release of the K5 rabbit virus added an active control to the ecology of the area, and gave the project area strong consequential benefits to adjoining properties, including conservation reserves. Project funding from VicTrack has allowed areas where species diversity was lacking to be planted out with indigenous species, and the Basalt to Bay’s first ecological burn was undertaken, in partnership with local Country Fire Authority (CFA) brigades. A partnership with Conservation Volunteers Australia (CVA) has resulted in new volunteers on the project, and given a good lead to future funding by other partners using this method. Facilitation efforts also resulted in the discovery and listing of a scar tree and a stronger options for biodiversity protection when dealing with likely renewable energy proponents in the future. 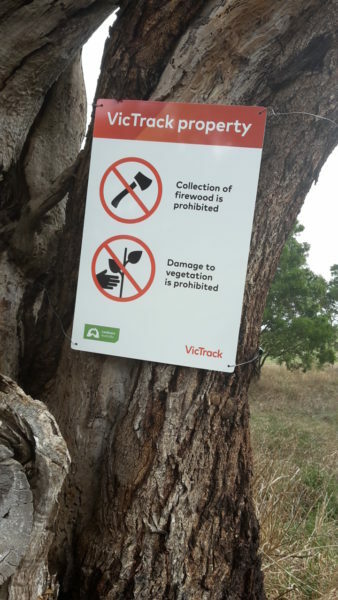 Following issues with illegal firewood harvest on the Green Line, signage was developed together with VicTrack, and erected. The signage appears to have successfully deterred firewood harvest.